Higher dietary intakes of Mg and Ca, individually, have been associated with a decreased risk for the metabolic syndrome (MetSyn). Experimental studies suggest that a higher intra-cellular ratio of Ca:Mg, which may be induced by a diet high in Ca and low in Mg, may lead to hypertension and insulin resistance. However, no previous epidemiological studies have examined the effects of the combined intake of Mg and Ca on MetSyn. Thus, we evaluated the association between dietary intakes of Ca and Mg (using 24-h recalls), independently and in combination, and MetSyn in the National Health and Nutrition Examination Study 2001–2010 data, which included 9148 adults (4549 men and 4599 women), with complete information on relevant nutrient, demographic, anthropometric and biomarker variables. We found an inverse association between the highest (>355 mg/d) v. the lowest (<197 mg/d) quartile of Mg and MetSyn (OR 0·70; 95 % CI 0·57, 0·86). Women who met the RDA for both Mg (310–320 mg/d) and Ca (1000–1200 mg/d) had the greatest reduced odds of MetSyn (OR 0·59; 95 % CI 0·45, 0·76). In men, meeting the RDA for Mg (400–420 mg/d) and Ca (1000–1200 mg/d), individually or in combination, was not associated with MetSyn; however, men with intakes in the highest quartile for Mg (≥386 mg/d) and Ca (≥1224 mg/d) had a lower odds of MetSyn (OR 0·74; 95 % CI 0·59, 0·93). Our results suggest that women who meet the RDA for Mg and Ca have a reduced odds of MetSyn but men may require Ca levels higher than the RDA to be protected against MetSyn. Although the following text will focus on magnesium in disease, its role in healthy subjects during physical exercise when used as a supplement to enhance performance is also noteworthy. Low serum magnesium levels are associated with metabolic syndrome, Type 2 diabetes mellitus (T2DM) and hypertension; consequently, some individuals benefit from magnesium supplementation: increasing magnesium consumption appears to prevent high blood pressure, and higher serum magnesium levels are associated with a lower risk of developing a metabolic syndrome. There are, however, conflicting study results regarding magnesium administration with myocardial infarction with and without reperfusion therapy. There was a long controversy as to whether or not magnesium should be given as a first-line medication. As the most recent trials have not shown any difference in outcome, intravenous magnesium cannot be recommended in patients with myocardial infarction today. However, magnesium has its indication in patients with torsade de pointes and has been given successfully to patients with digoxin-induced arrhythmia or life-threatening ventricular arrhythmias. Magnesium sulphate as an intravenous infusion also has an important established therapeutic role in pregnant women with pre-eclampsia as it decreases the risk of eclamptic seizures by half compared with placebo. 1From the Departments of Nutrition (LCD, SEC, and DM) and Epidemiology (FI, JHYW, MCdOO, and DM), Harvard School of Public Health, Boston MA, and the Division of Preventive Medicine (SEC) and Division of Cardiovascular Medicine (DM), Department of Medicine, Brigham and Women's Hospital and Harvard Medical School, Boston, MA (DM). Background: Clinical hypomagnesemia and experimental restriction of dietary magnesium increase cardiac arrhythmias. However, whether or not circulating or dietary magnesium at usual concentrations or intakes influences the risk of cardiovascular disease (CVD), including fatal ischemic heart disease (IHD), is unclear. Objective: We performed a systematic review and meta-analysis to investigate prospective associations of circulating and dietary magnesium with incidence of CVD, IHD, and fatal IHD. Design: Multiple literature databases were systematically searched without language restriction through May 2012. Inclusion decisions and data extraction were performed in duplicate. Linear dose-response associations were assessed by using random-effects meta-regression. Potential nonlinear associations were evaluated by using restricted cubic splines. Results: Of 2303 articles, 16 studies met the eligibility criteria; these studies comprised 313,041 individuals and 11,995 CVD, 7534 IHD, and 2686 fatal IHD events. Circulating magnesium (per 0.2 mmol/L increment) was associated with a 30% lower risk of CVD (RR: 0.70; 95% CI: 0.56, 0.88 per 0.2 mmol/L) and trends toward lower risks of IHD (RR: 0.83; 95% CI: 0.75, 1.05) and fatal IHD (RR: 0.61; 95% CI: 0.37, 1.00). Dietary magnesium (per 200-mg/d increment) was not significantly associated with CVD (RR: 0.89; 95% CI: 0.75, 1.05) but was associated with a 22% lower risk of IHD (RR: 0.78; 95% CI: 0.67, 0.92). The association of dietary magnesium with fatal IHD was nonlinear (P < 0.001), with an inverse association observed up to a threshold of ∼250 mg/d (RR: 0.73; 95% CI: 0.62, 0.86), compared with lower intakes. Conclusion: Circulating and dietary magnesium are inversely associated with CVD risk, which supports the need for clinical trials to evaluate the potential role of magnesium in the prevention of CVD and IHD. Background: Dietary magnesium might be related to colorectal tumor risk through the pivotal roles of magnesium in cellular metabolism, insulin resistance, and systemic inflammation. Objective: We evaluated the hypothesis of whether higher dietary magnesium intake is associated with reduced colorectal tumor risk. Design: A case-control study on colorectal adenomas (768 cases; 709 polyp-free control subjects) and a meta-analysis of colorectal adenomas (3 case-control studies) and carcinomas (6 prospective cohort studies) were conducted. Dietary magnesium was estimated from food-frequency questionnaires in the case-control study and most studies in the meta-analyses. Data analysis comprised multiple logistic regression analysis (case-control study) and fixed- and random-effects meta-analyses. Results: The case-control study showed a nonsignificant inverse association between dietary magnesium intake and risk of colorectal adenomas (OR for every 100-mg/d increase: 0.81; 95% CI: 0.62, 1.06). However, inverse associations were observed only in subjects with BMI (in kg/m2) ≥25, in subjects aged ≥55 y, and for advanced adenomas. 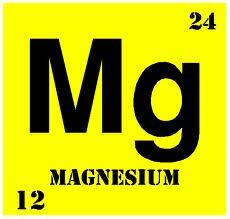 Associations did not vary by the calcium-to-magnesium intake ratio. In the meta-analysis, every 100-mg/d increase in magnesium intake was associated with 13% lower risk of colorectal adenomas (OR: 0.87; 95% CI: 0.75, 1.00) and 12% lower risk of colorectal cancer (RR: 0.88; 95% CI: 0.81, 0.97). Conclusions: Our findings support the hypothesis that higher intakes of dietary magnesium are associated with lower risk of colorectal tumors. The consumption of magnesium-rich foods may be a new avenue to explore further in the search for cancer-prevention strategies. Objective: To investigate the long-term effect of oral magnesium supplementation on clinical symptoms, bronchial reactivity, lung function and allergen-induced skin responses in children and adolescents with moderate persistent asthma. Design: A double-blind randomized parallel placebo-controlled study. Setting and subjects: The patients were recruited from the Pediatric Outpatient Clinic, Division of Pulmonology, Allergy and Immunology, and followed at the Center for Investigation in Pediatrics at State University of Campinas Hospital, Brazil. Thirty-seven out of 72 patients met the study criteria. There were no dropouts. Intervention: The 37 patients (aged 7–19 years, 19 males) were randomized in two groups: magnesium (n=18, 300 mg/day) and placebo (n=19), during 2 months. Both patient groups received inhaled fluticasone (250 g twice a day) and salbutamol as needed. The primary outcome was bronchial reactivity evaluated with methacholine challenge test (PC20). Results: After a follow-up of 2 months, the methacholine PC20 for testing bronchial reactivity has augmented significantly in the magnesium group only. The skin responses to recognized antigens have also decreased in patients treated with magnesium. The forced vital capacity (FVC), the forced expiratory volume at first second (FEV1), the forced expiratory flow at 25–75 and the FEV1/FVC ratio were similar in both groups. The magnesium group presented fewer asthma exacerbations and used less salbutamol compared to the placebo group. Conclusions: Oral magnesium supplementation helped to reduce bronchial reactivity to methacholine, to diminish their allergen-induced skin responses and to provide better symptom control in pediatric patients with moderate persistent asthma treated with inhaled fluticasone.